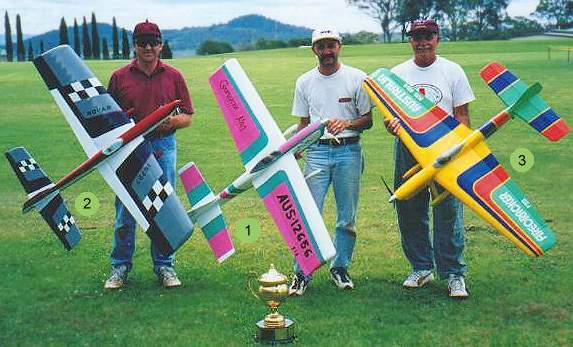 A description of the many competition classes developed in Australia for control line model aircraft during their years of popularity. 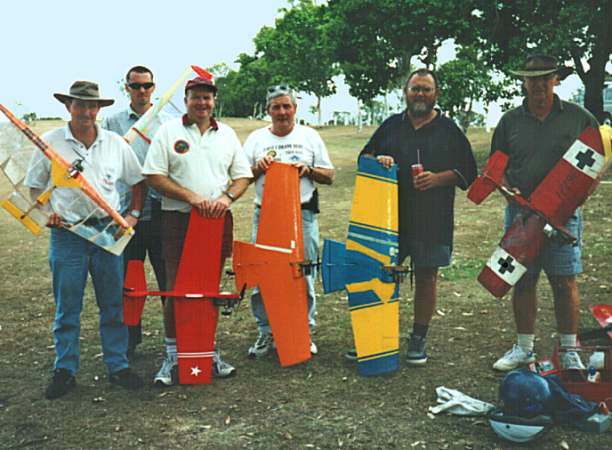 The unique combination of features offered by control line make possible aerobatics contests, pure speed contests, racing contests with required pitstops, midair combat contests, plus contests for realistic scale models. Contest classes were often duplicated to cater for different engine sizes and types (such as jet). 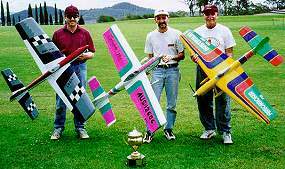 Contestants in aerobatics competitions are required to fly their planes through a series of prescribed maneouvres that can be assessed and scored by a panel of judges. The series of prescribed manoeuvres is called the "pattern", and in the early days Australia had its own, based heavily on the pattern used in America. Today, highly developed models compete using the international FAI F2B pattern and rules. In the early days of control line modellers realised that it provided an ideal opportunity for conducting speed competitions, as speeds could be measured accurately using simple equipment. Knowing the length of control lines (the radius of the flying circle) and timing a specified number of laps of the circle with a stopwatch, flying speed could easily be calculated with sufficient accuracy to separate competitors. See our speed page for more. Race three or four models simultaneously in one circle, limit the size of their fueltanks to force refuelling stops during the race, and the result is a Teamrace. Each team consists of a pilot and a mechanic, often assisted in the past by a third team member to carry the heavy battery used for starting glowplug engines. 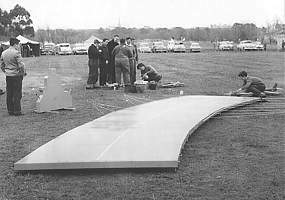 Teamracers were also intended to have engines cowled and to look like full sized aeroplanes, although this last requirement was rather loosely interpreted. Simpler racing classes called rat racing and Goodyear were developed later allowing unlimited fuel capacity, but still requiring pitstops. See our racing page for more details. 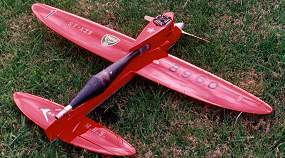 Orion, a Classic FAI teamracer. 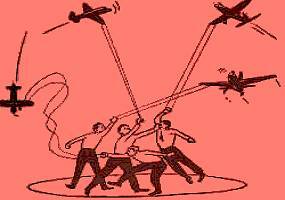 Mid-air combat became possible when paper streamers were attached to two control line models, and they were launched with the task of cutting each other's streamers. Not surprisingly collisions and crashes were frequent, but the participants seemed to enjoy themselves, and spectators loved it ! In the early years the "open" class, dominated by .35 engines, was where the action took place. Later, the FAI class with its 2.5cc engines came to the fore. Design of combat models quickly settled on variants of a flying wing, which were cheap, quickly built, and maneouvrable in flight. An ideal event for a capable and aggressive pilot. 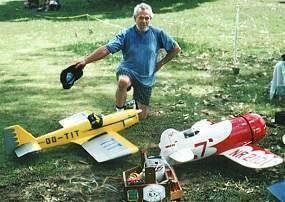 As in several other competitions for model aircraft, technical advances led to the opinion that the event had become so specialized, cut throat and expensive that much of the fun had disappeared. In an attempt to recapture the enjoyment of simpler times, rules have now been invented for vintage and slow combat classes. "You breaka my plane ... I breaka your face!" 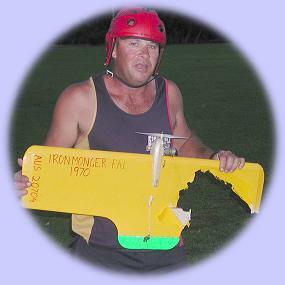 See Mike Bellamy's combat page for a description of of FAI combat in Sydney in 1983. An interesting class that failed to attract a long-lasting following involved take-offs and landings on a replica of a navy aircraft carrier. Arrester cables can just be seen crossing this deck, set up at Albert Park, Melbourne sometime around 1960. Perhaps the novel challenges of this event did not justify setting up the necessary equipment. For at least twenty years there have been moves to develop modern day competitions for models of the past. Such events go by names such as Vintage, Classic, Veteran, or Old Timers, and in some cases have been included in National Championships where they sometimes attract more entrants than their present day equivalents. 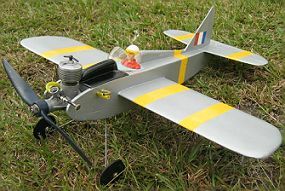 The Sabre Trainer pictured is one example of a racing class developing in 2008 for the old model with which many aeromodellers learned to fly. You can see more examples here. Developed 1999, revised 2005 by David Kidd. Your Webmaster is Ron Chernich.